I am a double cleanser and I always start by using a balm cleanser to remove all the dirt, grime, makeup and anything else lurking on my skin. 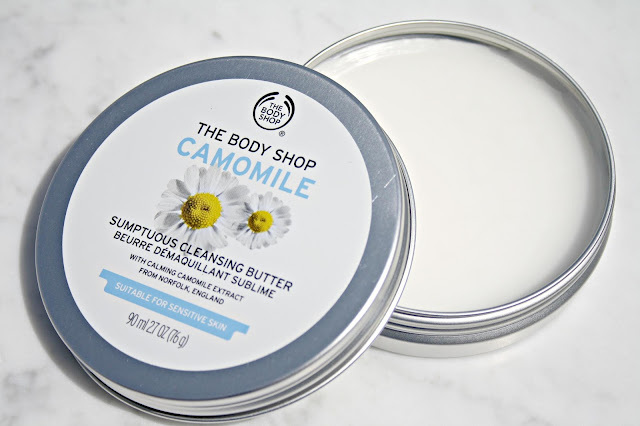 Having run out of the two balm cleansers I have been using, I thought it was about time to I gave this Camomile Sumptuous Cleansing Butter from The Body Shop a try. Not only is it suitable for all skin types, especially sensitive skin it is also suitable for those who wear contact lenses, which I sometimes do, though not too often. Described as being a butter, this cleanser is everything you might expect it to be from the description alone. It has a really lovely silky texture which is not quite like that if spreading butter on bread, it also smells incredibly fresh too and on the skin, it is so light and airy, it doesn't feel as though you are using anything at all, the only give away being your makeup is suddenly running down your cheeks. To use, I dip my fingers into the butter and warm it between my palms and then rub it onto my skin, at the same time, I always ensure there is warm water in the skin and a muslin cloth in the skin. As the butter comes into contact with the skin, it immediately begins to work to remove absolutely everything. Being a butter, it is slightly runnier than a balm, but it does just as good as a job. Soothing, moisturising and nourishing, I love the ease of use with this balm and I can see why it is loved and raved about so much. After using, my skin is soft and smooth and there is no residue, greasiness or tacky feeling to the skin. Incredibly calming, I've not had any adverse reactions and I absolutely love it, so much so I've got a backup tin already waiting. Priced at £13 from The BodyShop right here and if you are quick you can grab yourself 35% off using the code 14672! I so love to try this product. This would be perfect for my skin.Thank you! I adore their Chamomile range and am currently loving the oil cleanser but will also try this! This is one of my favourite cleansers! I absolutely love it. The oil version is also lovely. I love cleansing oils when it comes to makeup removal but I want to get into cleansing butters/balms. I've been eyeing this one from the body shop and I definitely need to pick it up! I've tried the chamomile cleansing oil (and loved it) so I'll need to check out the butter! I absolutely adore this cleanser, one of my all time favourites!! I know so many people who love this, and I am tempted to pick it up when I run out of my Clinique one - it looks amazing! Facial Cleanser is very important to our daily skin care routine. I wanna try this one. 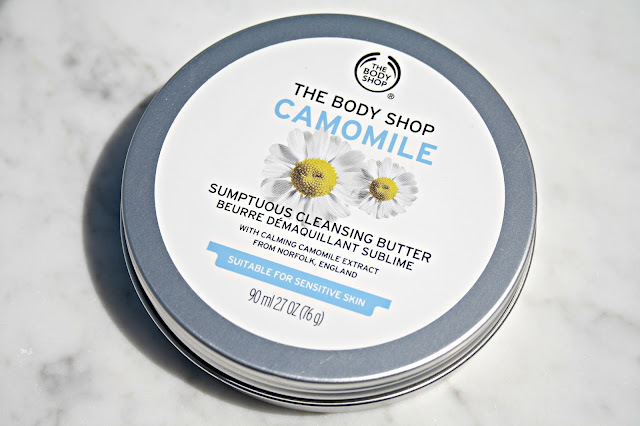 I mean, who would ever say no to this body shop camomile, right? I can already imagine the smell right now. Somebody gave this to me as a gift...and I love it!